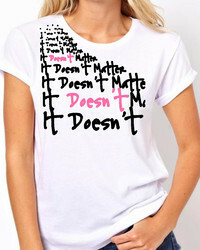 Xplor Fashion has a range of T Shirts that is fashionable, unique, quirky and motivational. Some with a bit of shimmer, some with a bit of bling but all different. Ladies Tees are body fitting 100% cotton. Mens Tees body cut platinum range. Colour ranges are mainly black, grey and white. Splashes of colour everywhere and beautiful prints. To name but a few we have, sassy, shady, moon surf, Amor, Love Luxury, Abyss.